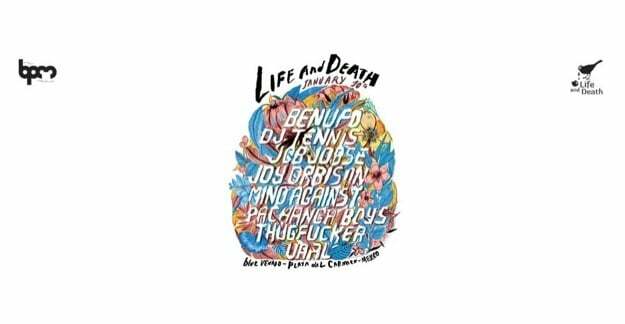 Berlin based label Life And Death kicks off the brand new year with a showcase at the BPM Festival in Playa del Carmen, Mexico. The versatile imprint is known for bringing along DJ’s who are not signed to the label and give the line-up a surprising twist. At the latest Amsterdam Dance Event for example, DJ Harvey was the eye catcher in a disco oriented room hosted by DJ Tennis. At BPM it’s Ben UFO and Joy Orbison. Ben UFO is one of the last remaining DJ’s whose popularity is mostly based on his sets and less on his productions. His skills in selecting and mixing dubstep influenced house and garage earned the Hessle Audio label boss a place in the Top 10 of the Resident Advisor DJ chart. A couple of years ago in his Rinse FM radio show he introduced the crowd to a young producer by the name of Joy Orbison. Contrary to the man that was so quick to recognize his talent, Joy Orbison is someone that has made quite a name for himself as a producer. His debut single Hyph Mngo was voted best track of the year by Fact Magazine in 2009. Since then he’s been releasing on Hotflush, Aus Music, SunkLo and his own label Doldrums Recordings. Together the two London based DJ’s will form a UK alternative to the darker German/Italian sound of the other performers at this event. ‘The others’ appearing at the BPM festival showcase are for example label managers Manfredi Romano aka DJ Tennis and Greg Oreck as one half of New York duo Thugfucker. Another duo, Mind Against, are up for a DJ set that could be very interesting as we can expect a lot of new work that will be released in coming months. Talking about production work, the other Italian Life And Death duo does not make the trip to Playa Del Carmen. On the event page the management apologizes for Tale Of Us not performing at BPM this year due to studio commitments. While they of course are great to have – they are after all the label’s number one act of the moment – there is absolutely no need to apologize with a line-up like this. On top of the acts named above, the showcase at the BPM festival also gives room to Vaal, Pachanga Boys and Job Jobse. Vaal had some interesting releases last year, all of them characterized as dark, melodic and intense, a Berlin deep house sound that the label bosses like. Pachanga boys are known for their somewhat dramatic long-stretched productions like Time and Röyksopp’s Running to the Sea remix and know everything about good build-ups. Job Jobse might need a little break (and a little tan) after playing many memorable sets during the final months of club Trouw and receiving a raking in RA’s Top 100 Artists. Is there a better way to wash away a winter depression that could pop up after his second home has finally closed its doors than playing alongside label friends at sunny Mexico? Of course there isn’t, so we can safely say that there is nothing standing in the way of another legendary Life and Death event!